TOKYO (AP) — A powerful typhoon that washed three American airmen in Okinawa out to sea, killing at least one, slammed central Japan on Monday, stalling trains and flights and triggering mudslides, before swerving to the Pacific Ocean. 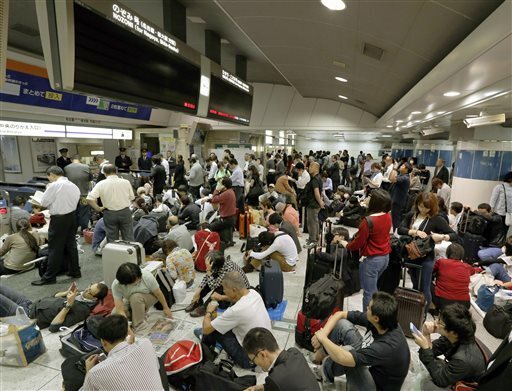 In Japan, bullet train service was suspended between Tokyo and Osaka because of the heavy rainfall, and more than 600 flights were canceled at Tokyo’s Haneda Airport. The trains resumed service later in the day, although with delays. Typhoon Phanfone came ashore near the city of Hamamatsu shortly after 8 a.m., and traveled northward before turning eastward into the Pacific north of Tokyo. Authorities advised more than 2 million people to evacuate, according to Kyodo News service. One of the three U.S. airmen who went missing on Okinawa’s northern coast was found dead. The other two were still missing, according to the Air Force and the Japanese coast guard. The Air Force said the search for the missing airmen had been interrupted by rough seas. Their names were being withheld pending notification of relatives. Okinawa is home to about half of the roughly 50,000 American troops stationed in Japan. Japanese broadcaster NHK reported one death, with five people missing. NHK footage showed flooded areas of Kanagawa prefecture, southwest of Tokyo, where people were wading in knee-high muddy water, and buildings and parked cars were sitting in big pools of water. The search for a dozen people still missing after a volcanic eruption in central Japan was suspended Sunday, and did not resume Monday, because of worries about possible landsides. The Sept. 27 eruption killed at least 51 hikers. In the Marianas, the eye of Typhoon Vongfong skirted Rota, a small island with about 2,500 residents where many buildings are made of concrete. Power outages and minor flooding were reported Monday morning. But by early afternoon, there were no reports of injuries or major damage anywhere on the islands as the storm moved away from the region. The weather service canceled a flash-flood watch for the islands. The brunt of the storm bypassed Guam, where many residents heeded warnings about high winds and flooding by taking refuge in designated shelters. As conditions improved, Guam officials shut down the island’s storm center, the airport resumed full operations, and government agencies and many businesses began reopening. There was some flooding in low-lying areas, but roads were passable. Typhoon Vongfong had maximum sustained winds of about 195 kilometers (105 miles) per hour, said Roger Edson of the National Weather Service in Guam. Winds on the islands of Guam, Tinian and Saipan were gusting to at least 102 kph (55 mph). Bordallo reported from Guam. Associated Press writers Becky Bohrer in Juneau, Alaska, and Yuri Kageyama in Tokyo contributed to this report.